So you want to create an online course or digital product or even offer a new kind of service to your clients. You’ve got the idea and have mapped out a plan for your product launch. You’ve even figured out if you’ll be using an online course platform like Teachable or deliver your new digital product DIY-style with the help of a service like Dropbox. Not so fast. Before you start creating, marketing and selling your new course, product or service, you’d be well served to first validate the idea and then to create what I call a Product Offering Plan. Creating your Product Offering Plan right now – instead of after you’ve created and launched a couple of new courses, products or services – will help you grow your online business a lot faster and with a lot more ease. In this article I explain why having a Product Offering Plan is an essential part of smart business planning for any small business or online entrepreneur and how it helps you to sell more with ease. Then I walk you through the steps of how to create a plan of your own. So grab a few sheets of paper and let’s get started! 1. It’s simply smart business strategy. When you map out how each course, product, program and service offering first, you can see how they fit together to form a suite of offers that not only serve your clients but which also make sense for your business. You’ll also be able to see where a product or service may be off brand for you or not within your business’s sweet spot. And if your ambition is to grow your online empire, mapping out your offers becomes an essential step to quickly growing your business to 6-figures and beyond. 2. 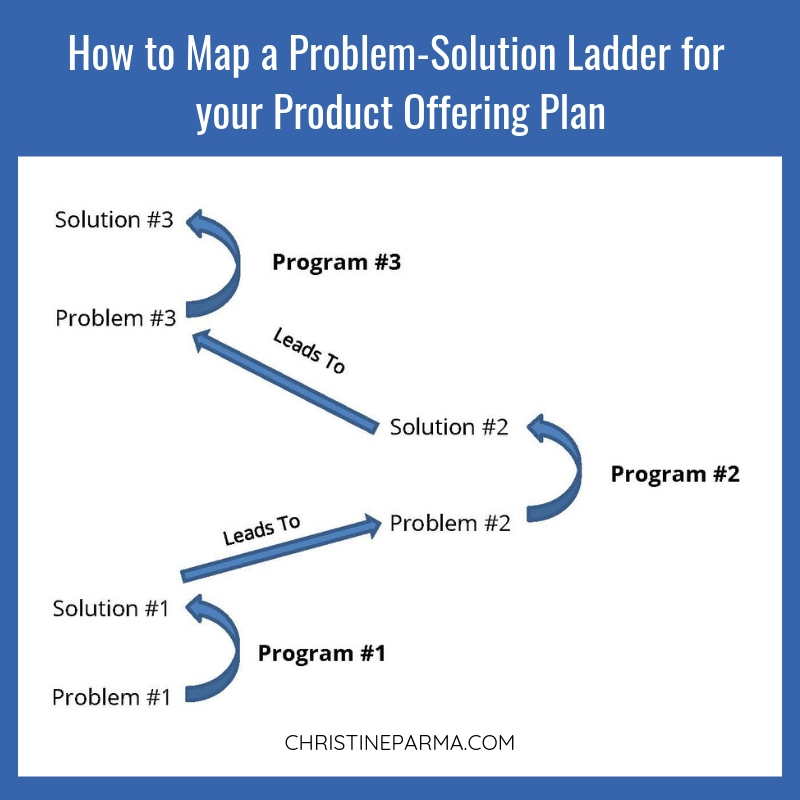 Mapping out your Product Offering Plan helps you to always know what to offer customers next. The feast or famine cycle is a vicious rollercoaster that results from not properly planning out your offers and revenue streams. Creating your Product Offering Plan helps you avoid huge swings in your sales and create more stable income in your business by allowing you to structure your offers in such a way that you anticipate the needs and desires of your customers. Instead of trying to come up with something to offer them, you plan out your offers so that they create a value and price ladder that makes sense for both your customers and your business. Even more importantly, a Product Offering Plan puts each thing you create into context with regard to your overall vision for your business and lifestyle. 3. You can create a more natural feeling sales funnel experience for your customers, which leads to more sales and happier customers. Before you invest a lot of time, energy and possibly money into creating and launching a bunch of new products and services, you want to make sure that you have a game plan for how and when you’ll offer each one to your potential customers. You want to construct your Product Offering Plan in a way that one purchase naturally leads into the next one. If you don’t, your customers may feel like you’re coming out of left field with unrelated offers that aren’t important to them. Even worse, when you randomly offer whatever you’ve happened to create at the time, your customers may decide that you’re not a brand worth buying from because they feel you don’t understand them and their needs. Your Product Offering Plan is the road map for everything you create and helps optimize all of your offers for long-term business growth. One of the most important outcomes of your Product Offering Plan is that you will have a precise way of organizing everything you create now or in the future to produce optimal, long-term revenue and client flow into your business, whether that’s from your premium programs, evergreen online courses, digital products or services. 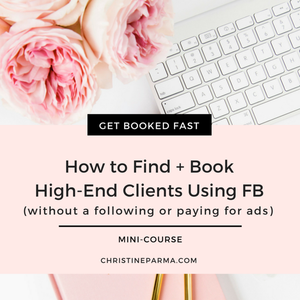 I’m sure you’re aware that it takes far more time, energy and money to find and enroll a new client than it does to offer a program or service to an existing client. By creating your Product Offering Plan, you continually leverage your current clients to grow your business even more quickly and sustain that growth over the long term. Instead of launching programs, products and services haphazardly, you’ll have a plan to guide you for the next couple of years. If you want to make a great living as an online content creator, coach or digital marketer, then completing this step first and revising it as you get insights into what your customers really want will help you immensely. Your Product Offering Plan acts as a road map for creating your series of offers and is based not on what you feel like offering or what seems like a good idea to offer when you hit that “Oh, I’ve got to come up with something else to sell” point in your business, but rather the plan is based on solving your ideal customers’ problems and providing them solutions in a natural and logical sequence. By doing so, your offers will naturally be more enticing to new customers and your current set of clients will be more likely to keep buying from you. This leads me to one of the biggest mistakes so many entrepreneurs make when trying to decide what to offer and when to offer it, which is that they focus on themselves or the features of their product instead of the needs of their clients. Instead of thinking of your offers first from a “What can I sell?” perspective, ask yourself, “What’s the next piece of knowledge or skill set my clients need in order to be even more successful?” or “After my clients finish this first program, what problem do they need solved next?” If you focus on your needs instead of your clients’ needs, your offers are going to fall on deaf ears and you’ll find yourself frustrated that very few people – if any at all – take you up on your self-proclaimed amazing offer. 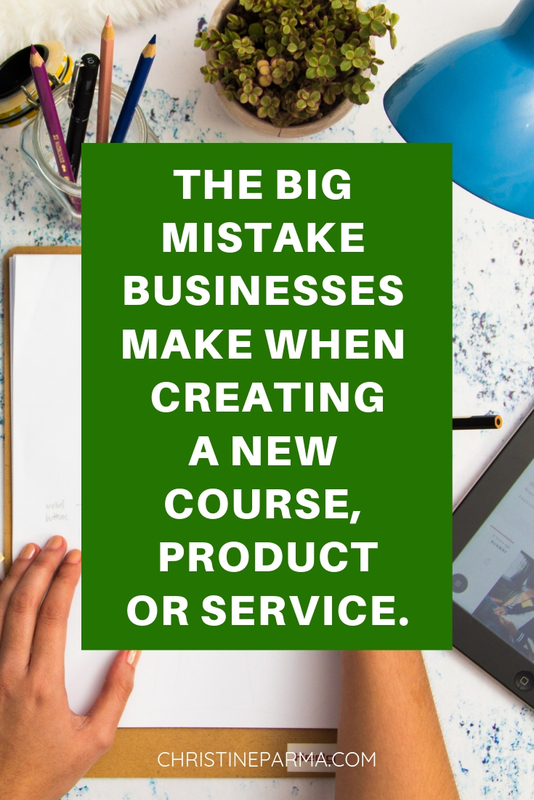 Of course, as you and your business evolve, you’ll likely make some changes to the plan, but you’ll have done most of the work ahead of time by laying out your framework of courses, products and services. That puts you light years ahead of most solopreneurs and some small businesses that simply throw out offers randomly to see what works. A lot of the reason many well-intentioned, heart-centered entrepreneurs fall into the “self-focused” trap is that they fundamentally misunderstand what it means to be in business and how to build a profitable small business. Many solo businesses are launched from a place of passion, which is fantastic because it can be a huge motivator to keep going when the road gets a little bumpy. At the same time, if you base your business on offering only what you want to teach – instead of what your clients want and are willing to pay for – then in reality you have embarked on pursuing an expensive hobby instead of launching a business. A hobby is an activity or interest pursued for one’s own pleasure or passion. A business, on the other hand, survives by solving real-world problems for its ideal customers or target market and doing so at a profit. The next principle to understand is that a new set of problems surfaces with each solution. Meaning, once your client has obtained a solution to her current problem, she will logically face a new one that you can help her solve. Your Product Offering Plan helps you create a logical offer pathway - and the marketing that goes along with it - that is clearly sequenced and informed by what your ideal customers need and in the order that they need it. Problem 1-Solution 1, Problem 2-Solution 2, Problem 3-Solution 3 and so on. When you create offers and market them in ways that position your product or service as the natural next step for your customers to take based on the needs or desires they still have, you won’t have to try so hard to sell people on the value of what you’re providing. Your product or service will be simply become the logical follow-up solution to the problem gap that was created or still remains as a result of the previous problem being solved. This may be a little counter-intuitive at first. So, let’s walk through a concrete example from my own business. Here’s an example that walks you through the problem-solution “ladder” so you can understand it a bit better. If you’re in business, your operational needs fall into three basic categories: product, people and profit. First, you need something to offer folks – that’s your product, program, online course or service (all referred to as “product” in this example). Second, you need people to buy your product. Those are your target audience, ideal customers and current clients. Third, in order to stay in business, you need to create a profit. At its core, business is really this simple in concept. It’s in the “how” and “doing” that things can become more complicated. To continue with this example, let’s look at the Profit Now with Premium Programs private coaching program I offer. As I said, a business needs a product to offer and, in this case, it is a program that teaches my clients how to offer their services packaged as premium programs. Well, a lot of people don’t know what to offer or how to create a premium program that is enticing to their target audience. So, Problem #1 from my ideal client’s standpoint could be stated as “I don’t know how to create my own premium program that people will want to buy at a higher fee”. Logical Solution #1 is to show my clients how to create their own premium programs based on solving the urgent problem of their ideal customers. After my clients leap over that hurdle, the race is not over, though. The next hurdle is people… namely, finding and enrolling clients into their programs. That’s Problem #2. So in the Profit Now with Premium Programs curriculum, I show my clients a specific method that they can easily implement to find and enroll their ideal clients. Then we move on to Problem #3, which is profit. How do you price a premium program so that you make a profit? Profit is what sustains a business, which is why I dedicate an entire module in my program to pricing and value positioning. That’s the product-specific “micro view” of the problem-solution flow in a nutshell. Now, let’s take it up a level to viewing my Profit Now with Premium Programs coaching as Big Solution #1 within the context of my business’s overall Product Offering Plan. If we consider that my coaching program solves the specific problem for my clients of knowing how to create, launch and enroll clients into their own signature premium or high-end courses, programs and services (we’ll call it Big Solution #1), what is the inherent Big Client Problem #2 that arises from Big Solution #1? Can you guess what it is? The next logical problem is how to systemize client acquisition for your premium or higher fee courses, programs and services. For example, let’s say you, too, create a high-end coaching program. Once you have your one-on-one premium coaching program created, you’ll start by enrolling clients in it on a one-on-one basis. But enrolling clients in this manner can be time-consuming with lengthy application processes and enrollment conversations, but they provide a lot of value feedback for your and your business when you first create a high-end offer. If you’re offering premium products or services, you need to know how to have client conversations that are authentic, non-salesy, compelling and position the immense value of your product or program at the same time because any leveraged client acquisition strategies you use later will be based upon the insights you get from having these first client enrollment conversations. They are a chance for you to really pinpoint what connects deeply with your ideal clients versus what is ineffective. Eventually, as you enroll more and more clients into your program and you’re actively working with them, you’ll find that your time and energy get squeezed. Many entrepreneurs eventually fall into the feast and famine cycle of enrolling enough new clients to hit their income goals, but it ends up resulting in a major time crunch with the majority of their day being taken up by client sessions. As a result, these business owners don’t consistently engage in client acquisition activities… and I’m sure you can predict what happens next. That results in a major lack of clients and income for the next sales cycle or month as their current ones finish up… hence, the famine. Unfortunately, this cycle can be hard to break. Therefore, Big Client Problem #2 is “I don’t know how to find and enroll more clients using less of my personal time to do so” or “I don’t know how to systemize my client acquisition.” Big Solution #2 is to learn and implement client acquisition strategies and systems that either don’t require your personal time or require much less of it so you can still grow your business and have consistent income coming in while you focus the majority of your time on serving your clients (or whatever you love doing most in your business). But, once you’ve got your client acquisition system up and running, inevitably you’re going to hit the point where you max out on how many private clients you can fit into your day. Big Client Problem #3 quickly surfaces as “I don’t know how to leverage my time and effort to serve more clients and create more income with less effort.” Big Solution #3 is to offer group programs or courses, meaning group live programs like seminars, workshops, events and retreats and virtual group programs such as premium group programs, masterminds and/ or more self-paced online courses. Each problem-solution pair can be the basis for a stand-alone premium program, online course and/or supporting “side” services and products, if you want to create a premium program yourself around solving each problem. However, even if you don’t create the next logical solution for your client, your client will still face the problem and seek out a solution from someone, which is why you want to be aware of what the problem is at each stage. Once you have the content outline for your product, course, program or service, think about your product in the overall context of what your ideal clients need solved first, second and third. As you outline your Product Offering Plan, where do your current products - or the ones you plan to create - logically fall in the sequence? What other products or services would support your customers’ success in the product that comes right before it and right after it? Are these things something you want to offer? If not, who could you partner with to offer those additional support systems as a bonus or extra resource that your customers can purchase at a special rate? For instance, is there something which would be beneficial for your customers to know or be able to do as a preceding step to enrolling in your current course, coaching program or before downloading and using your product? What’s the foundation or knowledge they should have in place beforehand so that they will get the most out of your current or planned course, product or service? And, after your customers complete your course or program or are using your product, what problems do they face next? What solution must they obtain in order to keep progressing? Or what new desire arises from using your product (for example, your product may have opened up new possibilities for them so that they now have different desires). Then, if you want to help your customers solve those next problems or new desires, how do you want to go about doing that? For example, would they benefit from another entirely separate course or product, additional private or group coaching or an intensive or retreat? What problem would you be solving and what delivery method would fulfill your customers’ needs and desires the best? The answer to that question is what you base your next offering on. That way, you are always offering something that your clients actually want and need! Now I want to make a very important point: Even though you’re creating your Product Offering Plan now, you are NOT going to go out and start creating everything in your plan at this very moment! That would scatter your energy and efforts so much that, more than likely, you’d become completely overwhelmed and not even one of your new offerings would find much success. The purpose of the Product Offering Plan is to have a vision and a road map for where you want to go so that when your clients say (even if only to themselves), “I absolutely LOVED your course! Your product is amazing! What else do you have?”, you’ll have anticipated their needs and desires and can guide them to those solutions, making the sales process a lot easier overall. Remember, even if you haven’t yet created a course, product or program, you can still pre-sell it. In fact, it’s the smartest approach to take! For example, if you have current coaching clients who you’ve helped solve a big problem they had, but who are still facing the “follow-up” problems, you can position a new coaching engagement like this: “I’ve got a coaching program that solves X problem with Y result, but I haven’t yet opened it up to the public for enrollment. As one of my clients, I’d be happy to offer you preferential pre-enrollment in the program so you can be sure to get a spot before they’re all gone. How does that sound?” Your client is already happy with the results she’s gotten from working with you, so it’s the perfect time to offer your next program (or course, product or service). She’s almost guaranteed to say yes! Now that you’ve learned about the concept of creating your Product Offering Plan, is there any content you should go back and remove from a current courses, programs, products or services (or ones you’ve already planned to offer)? As you create your plan, you want to keep in mind that you should save some of your great content and expertise for future offers. You can take the “extra” information and include it in another course or product, if it makes sense to do so. Even if you feel that you’ve structured your program correctly, it’s always a good idea to go back and look at your program within the context of your offering plan, as well as from your customer’s perspective. Overstuffing your courses or programs with too much information that instead of helping your customers or students solve a problem, actually can overwhelms them, keeps them stuck in the problem state and results in them not finishing your course or not using your product (after which they may conclude it wasn’t worth the money). Instead of having happy, successful customers who love your brand, you may end up with unhappy people who ask for refunds and never buy from you again (yikes!). “You Incorporated” is a business and, therefore, you need to do some planning. Your Product Offering Plan is an essential part of that. Expect that you’ll make adjustments to your plan as you get feedback from your clients and you start to see what people love and want more of and what they couldn’t care less about. And, you’ll most likely tweak your plan as you find out more about which methods of sharing your brilliance you love or hate to engage in. Your Product Offering Plan will help you to make smart business decisions, give you a vision for what to move forward with for new products or services and help sustainably grow your brand and business with a lot more ease. Did you find this article helpful? I’d love to hear about it! And please let me know what your Product Offering Plan looks like as you map it out. Feel free to post questions in the comments below. Thanks!